Neblett, Beard & Arsenault is a nationally recognized law firm with over 25 years of experience handling toxic tort litigation. Richard Arsenault, senior and founding partner, has filed a class action lawsuit and is investigating further legal action against DuPont in connection with possible side effects associated with the Imprelis herbicide. CLEVELAND, OH – July 24, 2011 – (Docket 1:11-cv-01517) Richard J. Arsenault of Neblett, Beard & Arsenault has filed a class action lawsuit against DuPont over reportedly harmful effects linked to their newly introduced “Imprelis” herbicide. The suit was filed on behalf of victims who claim to have suffered extensive and permanent damage to their trees, lawns and gardens after the use of Imprelis. According to the lawsuit, Imprelis was applied in accordance with the directions supplied by DuPont. Despite the care taken by lawn care professionals, the application of Imprelis is alleged to have resulted in serious and permanent damage to non-targeted vegetation, including mature trees. 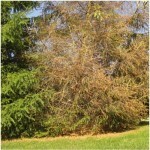 Reports of tree deaths and damage linked to the use of Imprelis began surfacing in late May of 2011. DuPont has issued a warning letter to landscaping professionals urging them to not apply Imprelis near Norway Spruce or White Pine trees while the company investigates the reports. Additionally, the EPA is launching an investigation into tree death and damage reports in Minnesota, Indiana, Illinois, Ohio, Michigan, Pennsylvania, Maryland, Delaware and West Virginia. According to the lawsuit, Ohio appears to be the epicenter of the damage, since the chemical has been applied to thousands, if not tens of thousands, of lawns and other properties throughout Ohio. According to the lawsuit, victims began to notice trees located in the proximity of Imprelis application sites were yellowing, losing canopy and dying. They are seeking damages against DuPont in a lawsuit that was filed in the United States District Court for the Northern District of Ohio, Eastern Division.